We understand that this is a difficult time for your family. In order to help you select the best cremation options for your loved one, we’ve put together several cremation service packages. These preselected packages include the services and merchandise most often selected by the families we serve. In addition to making your cremation and service planning easier, each package represents a cost savings over purchasing each item a la carte. All our cremation services and products can be purchased separately, or added to any of our packages. You can find our full general price list here. Includes all the services of our staff, facilities and equipment for a ceremony in our service room, initial local transportation of the deceased (within Multnomah, Clackamas, Washington or Clark Counties), embalming or alternative preparation of the remains and use of our refrigeration facilities, dressing and casketing, visitation period 1 hour prior to the service, Oak Chapel Rental Container, **submission of obituary information to newspapers & placement of obituary on our website, Oregon State filing fee, 1 certified copy of the death certificate, traditional cremation process and placement of cremated remain in a minimum cardboard container. $25 urn credit. *A credit of $500.00 may be applied to the cost of another cremation container or casket from our selection. ** does not include media/newspaper publishing fees. Complimentary (no charge) online obituary available on Omega’s website upon request. Includes all the items and services in Package A, **submission of obituary information to newspapers & placement of obituary on our website, transportation of the casketed remains to the church or place of your choice (within Multnomah, Clackamas, Washington or Clark counties). 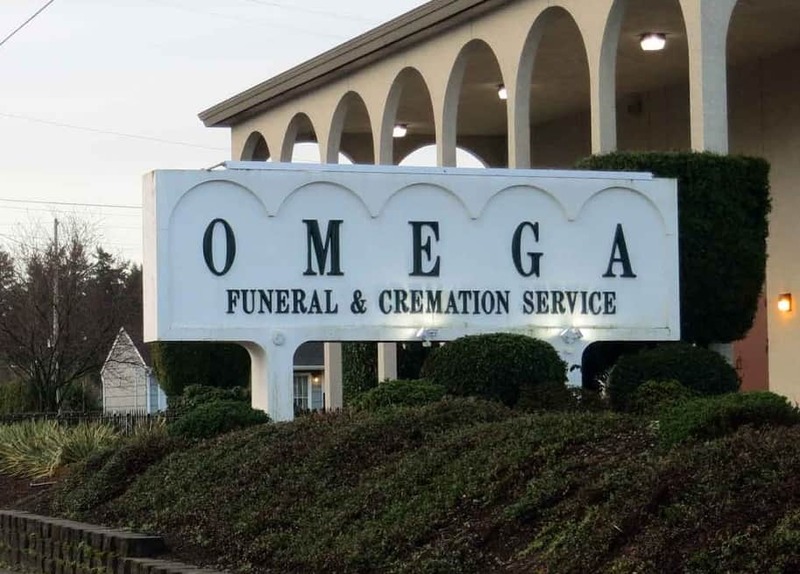 This funeral home requires that the remains must be in a cremation container with handles when transported to another location. * A credit of $500.00 may be applied to the cost of another cremation container or a casket from our selection. ** does not include media/newspaper publishing fees. Complimentary (no charge) online obituary available on Omega’s website upon request. Public Viewing / Visitation Period for 1 day (or portion thereof) with cremation of the remains to follow. Includes all the services of our staff, facilities and equipment for a public viewing/visitation, initial local transportation of the deceased (within Multnomah, Clackamas, Washington and Clark counties), embalming or alternative preparation of the remains and use of our refrigeration facilities, dressing of the remains, use of viewing facilities for 1 day or portion thereof (during normal business hours), Cascade viewing container, **submission of obituary information to newspapers & placement of obituary on our website, Oregon State filing fee, 1 certified copy of the death certificate, traditional cremation process and placement of cremated remains in a minimum cardboard container. $25.00 urn credit. *A credit of $95.00 may be applied to the cost of another cremation container or casket from our selection. ** does not include media/newspaper publishing fees. Complimentary (no charge) online obituary available on Omega’s website upon request. Includes all services of our staff, facilities and equipment for a private viewing visitation, initial local transportation of the deceased (within Multnomah, Clackamas, Washington & Clark counties), minimal sanitary care and dressing or shrouding of the remains, use of refrigeration facilities, use of viewing facilities for up to 3 hours, Cascade viewing container, **submission of obituary information to newspapers & placement of obituary on our website, Oregon State filing fee, 1 certified copy of the death certificate, traditional cremation process and placement of cremated remains in a minimum cardboard container. $25.00 urn credit. *A credit of $15.00 may be applied to the cost of another cremation container or casket from our selection. ** does not include media/newspaper publishing fees. Complimentary (no charge) online obituary available on Omega’s website upon request. Basic Cremation Without Viewing / Visitation by Anyone or a Ceremony with our staff involved. Includes basic services of our staff, facilities, initial local transportation of the deceased (within Multnomah, Clackamas, Washington & Clark counties), use of refrigeration facilities, basic cremation tray, **submission of obituary information to newspapers & placement of obituary on our website, Oregon State filing fee, 1 certified copy of the death certificate, traditional cremation process and placement of cremated remains in a minimum cardboard container. Includes basic services of our staff, facilities, initial local transportation of the deceased (within Multnomah, Clackamas, Washington & Clark counties), use of refrigeration facilities, **submission of obituary information to newspapers & placement of obituary on our website, Oregon State filing fee, 1 certified copy of the death certificate, Dissolution (Aqua cremation) process and placement of cremated remains in a minimum cardboard container. Cremation of deceased persons over 300 lbs. Under certain circumstances, there may be required items not included in your package. We understand that this is a lot to take in during a difficult time. We will advise you of any requirements that may apply in your situation and how best to meet them. * For deaths occurring in Clark County, Washington, please add $25.00. please call us at 503-231-6030, 1-800-922-6402.